Miguel Ramos, a middle-aged student from Colorado, wanted to learn English to better understand what his teenage daughters were talking about. His work hours were long, however, and he could barely stay awake during night classes at the community college — especially when they involved hours of verb conjugations and memorizing grammar. Fortunately, his teacher, master instructor Mary Pelanek, who retired from teaching ESL math and science at a Boulder, Colorado High School, made an interesting suggestion: Watch English language soap operas with closed captions and, at the same time, use Google Translate on the smart phone to provide real-time translations. When hovering the smartphone camera over the closed-caption text, the app uses an algorithm to convert the written word to Spanish as the conversation unfolds. Translations aren’t always dead on and sometimes they’re dead funny, Pelanek warned, but they helped Ramos a great deal and definitely held his interest. It’s through this example we see the way Ramos and his teacher were able to turn to a raw form of augmented reality (AR) into interacting in English – which was where he wanted to be. That’s due in part to the uncertainty of whether or not it will work well enough to be worth the training and money necessary to roll it out ( and do it well), according to ESL teacher Michelle Cowans. An Australian teacher who works with immigrant adults trying to learn English, Cowans reported that her students learn more and faster when teaching is augmented with VR. Her findings have landed on a new but growing pile of research that shows VR technology used for learning is particularly effective for ESL adults who benefit from immersive, everyday experiences. The combination of more affordable VR technology tools, the availability of mass and proprietary programs like Google Expeditions, and the pervasiveness of adults with smartphones is also changing the game for immigrant adults, she said. Last year, Cowans used Google Expeditions—an education smartphone app which offers both VR and AR “tours”—to take her adult migrant students on seven different virtual adventures. Students went from touring Aurora Borealis to climbing El Capitan in Yosemite National Park and, as they became more sophisticated, designing their own expedition. What Cowans sees in her adult learners mirrors what several other language education departments across the country—from the University of Maryland to Washington State University—are researching and documenting. Washington University researcher Don M. McMahon, who specializes in studying these emerging mixed reality tools, said such immersion tools—whether clumsy or refined—are novel and effective. McMahon’s goal with his mixed-reality research is to create a knowledge base that demonstrates that the tools work, how and why they work, where they fit into the spectrum of teaching tools, and where there may be problems. He works closely with teachers for research purposes, and to train them on new tools. “VR has the advantage of offering multiple means of representation, multiple means of action and expression, and multiple means of engagement,” McMahon said, outlining basic principles of universal design for learning. According Charan Ranganath, who leads the Dynamic Memory Lab in the University of California Davis, virtual reality is a hook that goes straight to the brain. While remembering is part of learning, retaining a memory does not mean a person can act on that knowledge. For example, acing your French test doesn’t necessarily mean you’ll be able to successfully converse with locals in Paris. Ranganath says that in order to truly learn a language, the student must use the memory in another context, for instance, starting a conversation in a new language rather than passively watching others speak it or engaging with a computer program. Actively initiating an action stimulates the brain area called the hippocampus, a horse shoe shaped area of the brain that’s home to long and short-term memory, and emotional responses. And, the richer the context, the greater engagement with the hippocampus. Another part of what makes VR an effective learning tool comes from activating a person’s senses, which VR can stimulate. It’s possible, Ranganath went on, to design a VR experience to intentionally engage our brain directly and thoroughly. “You can set it up to engage almost every sense so you have a richer body of memories,” he said. Yet, how much the experience touches the brain comes down to the design, programming, and creation of the experience. Poor design will be the biggest shortcoming, he said. Yet, the impact is there. 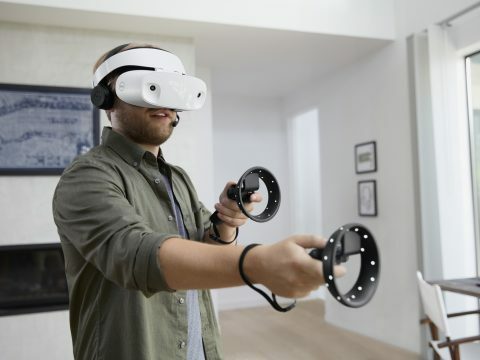 In June, researchers at the University of Maryland found that people retain memories from their VR experiences better than they retain information from flatscreen exposure. 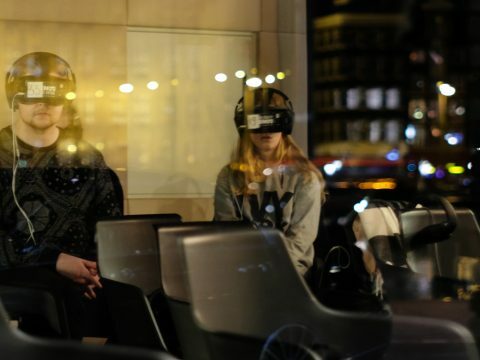 Participants from the study said the immersive ‘presence’ of VR gave them greater focus. This was reflected in the research results, where 40 percent of the participants scored at least ten percent higher than their counterparts who used desktop computer displays. One reason VR fosters individual learning, according to McMahon, is that students are able to suspend their disbelief. People get to see themselves functioning in the virtual scene — without doing it in front of others. According to McMahon, VR technology gives users the chance to bridge the experience between learning and context by immersing them into the experience of communicating without facing real social repercussions. McMahon says that Ramos using his phone’s camera for translation is a great example of learning through your own, lived experience. Sure, it’s not perfect and there are errors in the translation, but getting a lot of it right makes it a great resource. It’s a simple way for a student — particularly a working, busy one — to have an immersive and contextually-relevant experience. McMahon also likes to encourage students to play Pokemon Go in the language they hope to acquire.”If you can get your class excited about playing something familiar in another language, you’ve opened the door to learning,” he said. A few teachers, including Cowans, are already trying mixed reality methods in their classrooms. McMahon said that many more want to. “I can tell you that teachers everywhere are excited about using these platforms because they can see this as another way to engage people in learning that allows more tailored, focused learning,” he said. Still, it’s early for these platforms. “Part of what we’re trying to do is build a research foundation to help support educators’ decisions to use them,” McMahon added. As for when her students felt AR or VR aided their learning experience? “In every instance,” she said. Pioneer virtual reality journalist, Nonny de la Peña, inspires empathy by transporting viewers into someone else’s shoes. Once the domain of video game makers, virtual reality (VR) and augmented reality (AR) are transforming some of the world’s most traditional businesses.